5 bed, 5 bath villa, sleeps 10, rates include 13% local tax. 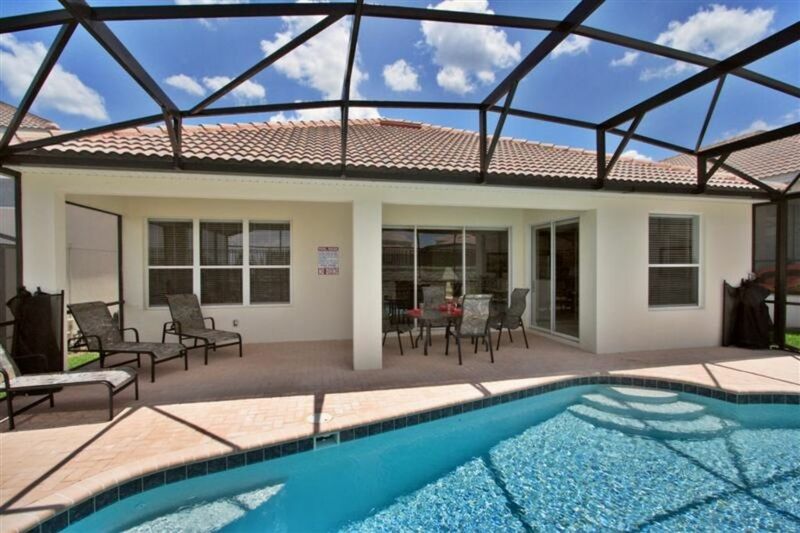 Come relax and enjoy our new 5 bedroom/5 bath pool home, perfect for a larger family or families. Location is key to enjoy all that central Florida offers and being 2 1/2 miles from Walt Disney World, the perfect base to explore the many attractions. Free WI-FI, 5 bedrooms, with cable LCD TV/DVDs, 2 kings, 2x2 twin beds & 1 queen, great room leather furniture, big screen LCD TV/DVD & dining seating 8, stainless steel kitchen & kitchen cubby area facing the pool great for morning “coffee”, shaded lanai with 6 high back chairs and 4 chaise lounges, sunbathe & enjoy Florida sunshine. Pool with a removable child safety fence for their protection. Garage game room with ping pong, magnetic darts, air hockey, basketball game & washer and dryer in the garage. Professionally furnished & managed, no detail overlooked, planned with your comfort in mind. About Windsor Hills Resort: 5 star rated Windsor Hills Resort, located just 2 ½ miles from Walt Disney World, and less than an hour from beautiful Florida beaches and Kennedy Space Center, the “Villa” is ideal for any vacation. The wonderful guard gated Windsor Hills Resort has a luxurious water park pool with fountains and a waterslide, a castle themed playground, HD theater, video game room, a fitness center, sand volleyball, putting and chipping green, basketball court and much more. From Wisconsin and enjoy our family trips to Florida. So much to do and see in the Disney/Universal area, along with great restaurants and just about any kind of recreation. Along with only about an hour to either coast for the beach. We love the location so close to Disney World. Enough space for a couple families and a great resort with the water park area. Use of all resort amenities and very close to the Disney parks. Bathrooms are all tile and each one accommodates a room. The garage game room offers ping pong, air hockey, and basketball game. A full size washer and dryer, for your convenience, is also located in the garage. The Windsor Hills clubhouse features a resort style pool with water slide, a game room, billiard room, fitness room and a small private cinema showing the latest films for children. There is also a children's Castle playground a few doors down along with basketball, sand volleyball, putting green and tennis courts. We found this house to be the perfect place to stay during our holiday. There were nine of us in our party, yet the house was plenty big enough for us all to have our own space without tripping over everyone else's feet. The pool was a lovely size and well maintained, and the games room, while simple, provided hours of fun for us. I have read other reviews saying that the place needs a deep clean, but that was not our experience. The entire house from top to bottom was exceptionally clean and well looked after. The entire complex was well looked after as well. The streets were clean, the grass verges and lawns to all properties were nicely cut and trash is collected daily. The security gates at the entrance to the complex meant the whole area was nice and quiet and I felt safe letting my children venture out on their own over to the play park and communal pool with flumes. As far as location is concerned, I don't think we could have been in a better place. The Disney parks are all within a 10 minute drive, and other parks such as Universal, Sea World, Discovery Cove etc, are all around 20 - 25 minutes away. The area contains many restaurants and cafes and also a large Walmart and Super Target, all within a few minutes drive. We plan on returning to Kissimmee in 2020 and will definitely be considering this house again. If there was a 3.5/5 I would probably have chosen that. The villa/house does what it says it will, 5 bedrooms, nice facilities, kitchen was well equipped, nice location and a nice pool/outside area. All very functional and it did what we wanted so no specific complaints. It just didn't really wow us though, it's starting to look a bit dated and it really needs a good deep clean throughout instead of the quick changeover clean, dirty window blinds and dust hoarding plastic plants throughout. The hockey and basketball in the garage was out of order but we didn't get much use from it other than the awesome washer and dryer in there! There wasn't really a boys and girls room as advertised, one pink princess room (2 beds), 1 more princess themed bed and a bed with a mickey cushion in another bedroom. This did cause some upset with my 6 year old boy after a long day of travel, he ended up in a double instead. Travel cot (pack and play) and highchair for my 1yr old was in good condition, though we had to get imaginative for bedding for him. The house is in a good location for using Windsor Hills facilities which are good and will soon include a kids splash area which was being built. The pool is not really overlooked at all (some are) other than by neighbours pools which is to be expected. Note this house has a Northerly facing pool though so sun is mostly around the front during the day if you plan on getting lots of use from that, not major for occasional use though, especially if you're willing to pay $25 a day for pool heating. We didn't. On the whole it was an OK stay. It just needs a bit of a refresh but served all our needs for a family vacation. This home is incredible! Spacious, clean, and well appointed. We particularly liked the bathrooms aligned to each bedroom, and the pool and spa. Would stay here again in a heartbeat! Loved it! There was so much space in this house! We had two families share the house so there were 9 of us. So much space and having 5 bathrooms was great! The parks were so close. Animal kingdom was about a 5 min drive(without traffic), universal and sea world about 20-25 mins away. I would highly recommend this house. It has its quirks but every house does. They are manageable. Would definitely stay again! The house is in a good location. The owner was responsive as well as the management company. With that said I personally would not stay at this house again. The house needs an extreme deep cleaning. Our second day my son was greated with a cockaroach as he entered the shower. There was black hair all over the floor as well which didn't come from anyone within my family. There were other things as well however no need to get into everything. These are things that can all be rectified. My mentality is with so many houses to choose from to rent in Orlando, why should I settle with mediocrity. This review isn't to dissuade people from renting this house. I'm simply just giving my feedback from my personal experience. We are sorry you were disappointed in your stay in our home. We have been renting our home for 8 years and have had professional cleaners after each and every stay. In addition, our home is professionally managed by someone whom we entirely trust with the care of our home. In addition, we have had professional pest control protecting our home for the 8 years. I have been told by the professional service that on occasion a bug may get in. This is Florida and this has been one of the warmest winter seasons on record. Come and experience Walt Disney World, Universal Studios with Wizarding World of Harry Potter, Sea World, top rated Blizzard Beach Water Park and Pleasure Island for any type of music and entertainment. In addition, Disney Springs is a popular shopping location. For golf lovers of every level, there are golf courses ranging from 4 local championship courses and many more modest courses for the novice. Right next door is highly rated Mystic Dunes golf course. 13.5% taxes are included in the rates. Discounts are available for some dates, please inquire. Pool/spa heat ($25/day), Spa heat only ($15/day) and BBQ grill rental are available upon request.